1. 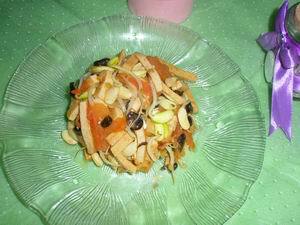 Cut dried tofu and tomato into shred. 2. Heat oil in a wok, add Seasoning A. stir fry till the fragrance comes out. 3. Add black bean sprout, dried tofu and tomato, warm water, stir fry 2 mins. 4. Add Seasoning B. Stir fry till cooked. Tip: Dried tofu absorbs water. If you don't add enough water it'll become very dry and not tasty.